Trees are the lungs of the world. They are the most beautiful things in creation. We make reference to them when we speak of life, and branches of our family. We depend on them for sustenance, shelter and shade; warmth and healing. Their flowers herald new life and the passing of the old one. The olive branch has been used as a symbol of peace; the laurel as one of victory and honour. Trees have always played a significant role in legends and myths, real life stories, fairytales, and have cultural significance, spiritual or religious value in many countries. Some are slow growing, others fast. They are homes for birds and bandits; squirrels and koalas. The eucalyptus tree can grow to over 60 metres tall. This gorgeous book begins with my favourite, the Olive tree, and ends with the Jacaranda. In between, trees from all different countries and cultures are represented in the 21 entries. 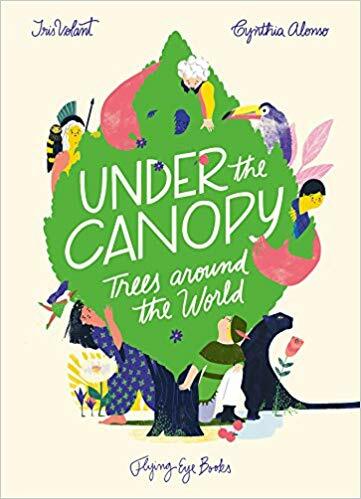 Their uses are displayed and accompanied by stunning detailed illustrations that reflect the respect and adoration given to trees, by people that see them as more than a log or a trunk. This book is an excellent learning tool for children. They can find out special information about trees, as they read the interesting stories and history about each type of tree represented here. It is a subject that is rarely seen in picture book format, but its beauty and value will be appreciated by people of all ages, not only the young.